A New Jersey gang member wanted in connection with a brutal, premeditated murder has been named to the FBI’s Ten Most Wanted Fugitives list, and a reward of up to $100,000 is being offered for information leading to his capture. 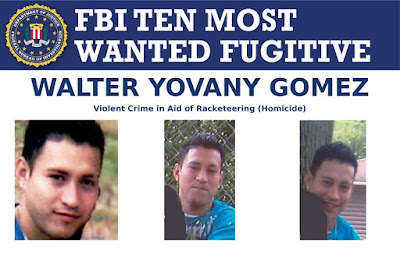 Walter Yovany Gomez, in his early 20s at the time of the 2011 murder in Plainfield, New Jersey, was attempting to become a full member of MS-13 by carrying out a gang-ordered killing. It didn’t matter that the target was Gomez’s friend—the man had allegedly shown disrespect to the gang. Part of the Plainfield Locos Salvatrucha (PLS) crew, Gomez was assigned the hit when his bosses heard that one of their associates had been seen socializing in a bar with a rival 18th Street Gang member. Ordering a murder for such a sign of disrespect is not uncommon for MS-13, a transnational gang known for its extreme violence.